Imagine an enterprise where everyone focuses on the highest customer value. Where strategy to tasks are visible so everyone knows if their work is aligned with the highest value work. Imagine an enterprise where a discovery mindset wins over certainty thinking. Where experimentation with increments and feedback help define the way toward customer value. Imagine a company where employees use 100% of their brain power to self organize around the work and be trusted to think of better ways to work. Where leaders encourage employees to put customer value first. Imagine an enterprise where customers embrace the products and services being built because they are engaged in the building of the work all along the way. If you can imagine it, it can be yours! In this unique and cutting edge Agile book, veteran Enterprise Agile Coach Mario Moreira, will guide you to build and run an Agile enterprise at every level and at every point from idea to delivery. Learn how Agile-mature organizations adapt nimbly to micro changes in market conditions and customer needs and continuously deliver optimal value to customers. Learn cutting-edge practices and concepts as you extend your implementation of Agile pervasively and harmoniously through the whole enterprise for greater customer value and business success. Incorporate the Discovery Mindset; experimental, incremental, design, and divergent thinking; and fast feedback loops to increase the odds that what you build aligns more closely to what customer wants. Use continuous Agile Budgeting and enterprise idea pipeline at the senior levels of the enterprise to enable you to adapt to the speed of the market. Reinvent Human Resources, Portfolio Management, Finance, and many areas of leadership toward new roles in the enablement of customer value. Establish a holistic view of the state of your Agile Galaxy from top-to-bottom and end-to-end allowing you to understand where you are today and where you’d like to go in your Agile future. Be truly Agile throughout the enterprise, focusing on customer value and employees over all else. This book is geared for: Sponsors of Agile Transformations; Executives and Senior Management; Agile Coaches, Consultants, and Champions; Portfolio Management; Project Management Offices (PMOs); Business and Finance; Human Resources (HR); Investors and Entrepreneurs; Scrum Masters, Agile Project Managers, and Product Owners. This book concludes with an adventuring through an Agile Enterprise story that shows you how an enterprise may transform to Agile in an incremental manner with materials in this book. 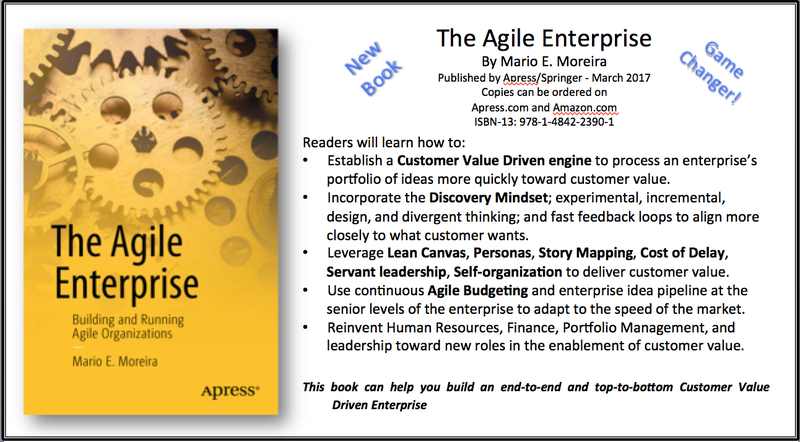 Let the material in The Agile Enterprise help you achieve your successful customer value driven enterprise. Thank you to the contributors JP Beaudry (on Story Mapping) and David Grabel (on Cost of Delay)! A special Thank you to the Apress editing team! I am seeing that you are fast closing. I have also a site related to you. Selling your house fast for cash can be a difficult task to accomplish. A timely and very pertinent topic. Having just spent 2 years coaching Agile teams in an enterprise where the business side was not on board, did not have an Agile "mindset", I can where this advice is invaluable.